Transitional justice — or the types of judicial and out-of-court settlements that facilitate the transition from conflict to peace or from authoritarianism to democracy — is a key peace-building issue. 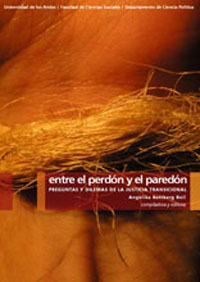 This book is the result of a collaboration between the Peace-Building Research Program (Programa de Investigación sobre Construcción de Paz) at the Department of Political Science in the Faculty of Social Sciences at the Universidad de los Andes and the International Development Research Centre (IDRC) in Canada. It provides a national and international conceptual and regulatory framework, and descriptions and comments on the institutional arrangements reached in different countries, as well as detailed studies of the ongoing challenges and dilemmas related to transitional justice. In this way, Entre el perdón y el paredón helps not only to identify the challenges that Colombian society will have to face to overcome its current armed conflict, but also to understand issues raised by transitional justice for those who study and apply it all over the world. Angelika Rettberg, PhD, is a professor in the Department of Political Science in the Faculty of Social Sciences at the Universidad de los Andes, and is the Director of the Peace-Building Research Program.